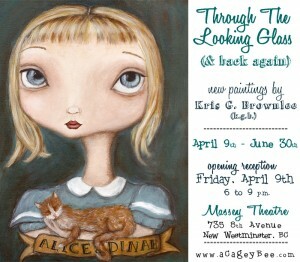 A solo art exhibition featuring new paintings inspired by classic characters and the imagination. I’ve been talking about all the painting I’ve been doing for my upcoming show for months now and it is finally time to start filling you in on the details. Past due, actually, but my brain doesn’t seem to work like that! I wanted to finish all of the paintings before I started doing the promotional work. Makes sense, right? Alas, when you have a gallery wanting to display 20 to 25 paintings, there is never enough time! I’ve been posting progress shots on my Flickr page and even though I’ve painted more in the last 3 months than ever before, there are still so many ideas rolling around my head (and my sketchbook). The creative juices are a’ flowing. Suffice to say, putting down the paintbrush to yell at Facebook while it errors every time I try to upload new photos has been painful, but it is finally done. Huzzah! So much more to share, but I have paintings to frame! Photos will be coming soon. Dorothy found a good home! 🙂 Great to meet you and we look forward to seeing you again. You have a beautiful web site. Your art makes me feel like a kid. Thank you.